The funds raised at the 1864 Metropolitan Fair supported the United States Sanitary Commission, an enormous civilian affiliate of the Union Army. 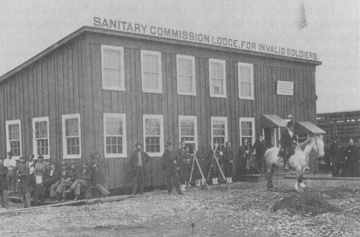 The Sanitary Commission assumed many duties during the War. 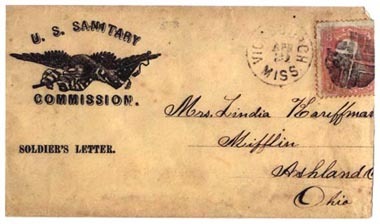 hand out doughnuts to Union soldiers. They acted somewhat like the USO in 20th century wars, giving soldiers beverages and refreshments. 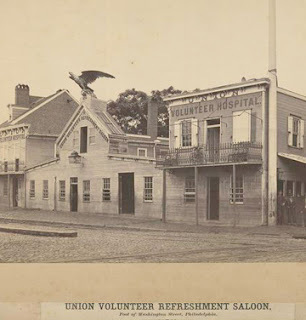 This Philadelphia "saloon" adjacent to a soldier's hospital announced it's presence with a magnificent eagle sculpture. Volunteers gave soldiers a place to rest, socialize and drink non-alcoholic beverages. Another volunteer saloon adjacent to a hospital. The Sanitary Commission ran the hospitals too. 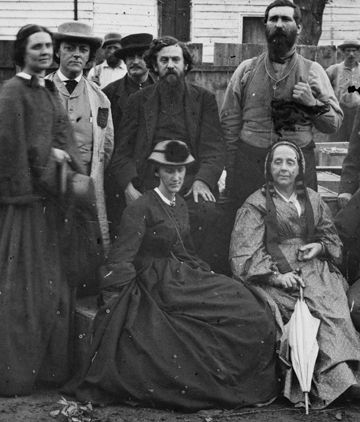 Following Florence Nightingale's leadership in England's Crimean War, this civilian organization saw a need and filled it. 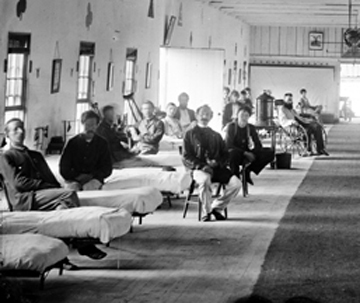 And field hospitals such as this one in Gettysburg. Activities went beyond physical nursing. They had systems for troop mail. 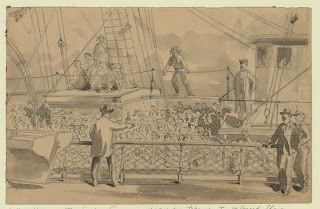 showing the Sanitary Commission tossing tobacco to freed prisoners. The USCC also ran lodges---rehabilitation homes for convalescent soldiers. Above a Lodge for Invalid Soldiers in Alexandria, Virginia. And a Lodge in Washington. The activities of the Sanitary Commission were well documented. The leaders realized that good public relations increased donations. In many of the photographs we see women, as in this photo of a field station in Fredericksburg. Women were not at the very top of the organization but they were, as we might say, middle management throughout the country. In many of the photographs we also see crates and barrels full of materials headed for the hospitals and recovery lodges. 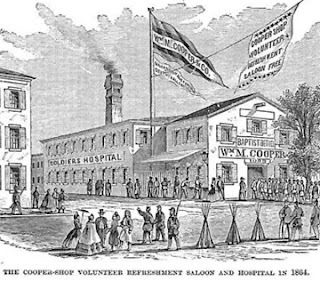 One of the major functions was coordinating donations for the hospitals, lodges, saloons and doughnut stops. 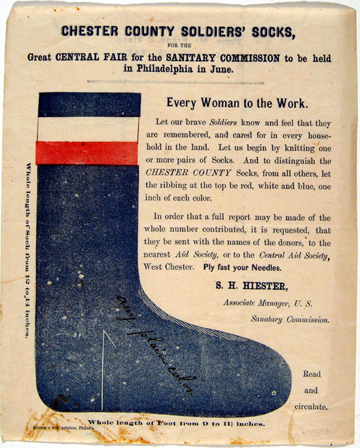 Women knitted socks, pieced quilts, stitched underwear and nightcaps for recovering soldiers. 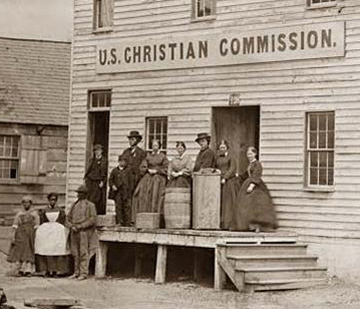 Barrels and boxes from the Christian Commission. Wagons full of supplies heading for the front. 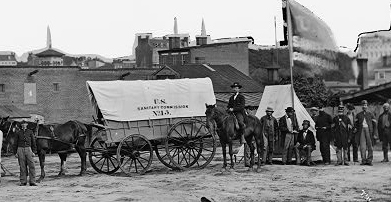 The Libary of Congress is the source for these photographs of the volunteer societies. 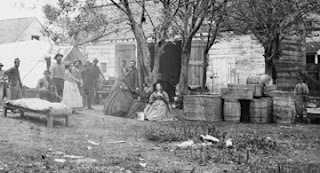 They have scanned many Civil War photos at a high resolution so you can open the TIFF files and examine the smallest details. Click on this one and open the smaller TIFF file. You can see so much in their faces. I am always interested in how each working woman found a solution to the hoop skirt dilemma. There is quite a range of circumference. You always find the most wonderful history of quilting and photos to go along with it, enjoy reading the posts and learning something new. 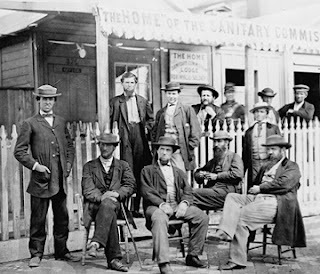 I recall reading some controversy about the men at the top of the Sanitary Commission. Were they really active in and founders of the organizationization, or was it just necessary to have men as the nominal officers of the organization because of coverture laws prohibiting married women from doing business on their own? Everything I've read credits women with running the Sanitary Commission. I suspect the men were drafted just for banking and legal cover. Wonderful post! I have done some research myself into both the Sanitary and Christian Commissions and always love learning more about them whenever I can. Thanks for sharing those amazing images...some I have seen before but many were new to me and awesome to see. What a thorough post! I'm always happy to see attention paid to the Sanitary Commission, which I think was full of unsung heroes. In fact, my novel Wedded to War is inspired by the diaries and letters of Civil War Sanitary Commission nurse Georgeanna Woolsey. 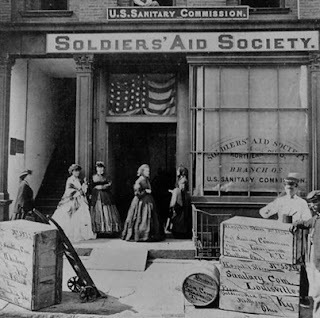 Suzanne, to answer your question in a nutshell, the Sanitary Commission grew out of the Women's Central Association for Relief, founded in New York City. They did bring men into the leadership of the USSC to gain credibility. The men in leadership, such as Elisha Harris, Henry Bellows and Frederick Law Olmsted, actually did a lot for the organization, but of course most of the work was carried out by the thousands of women across the country who made of the chapters. If you're interested in the USSC, I think you'd enjoy my novel, which includes historical figures of the USSC among the characters, such as Olmsted, Frederick Knapp, Dr. Elizabeth Blackwell (who founded the Women's Central Association of Relief), etc. I don't mean to make a sales pitch here- your local library may have it- but for more info on the book, see www.heroinesbehindthelines.com. As a "retired" re-enactor, hoop skirts are counter productive to any kind of work. 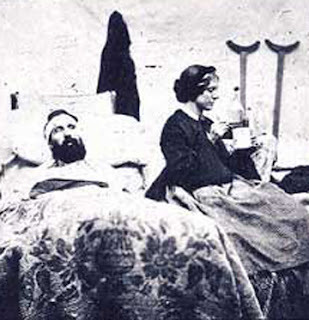 I have seen pictures of women nursing soldiers minus the hoop skirts. But to be photographed you needed to be correctly dressed. It was a strange fashion, but is still a fantasy dress of many girls. 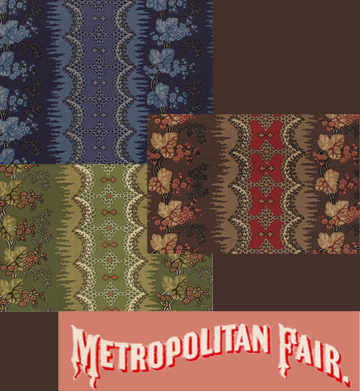 Would that be an applique quilt in the fifth photo down? Love the research you put into your blog posts! Thank you it is eagerly read and most appreciated! 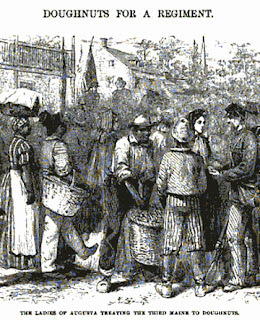 Suspect the image shows the fine women of August, Maine, at work. 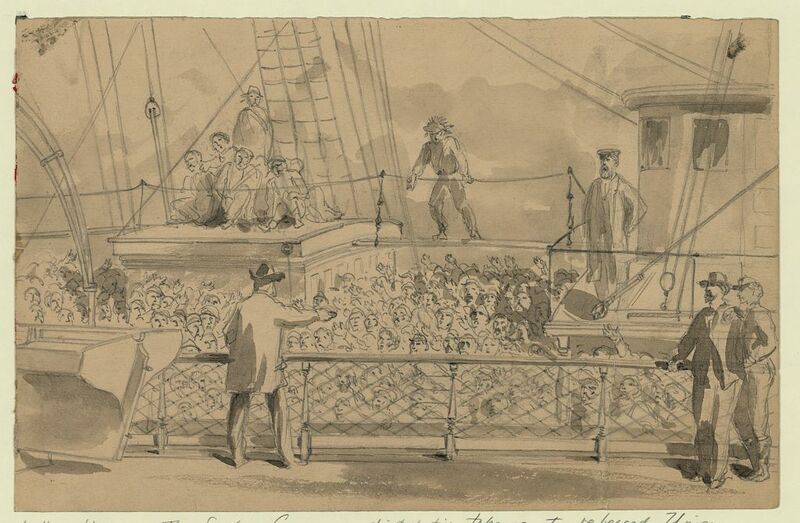 Augusta, Maine, is the state capital and the state was active in the war. 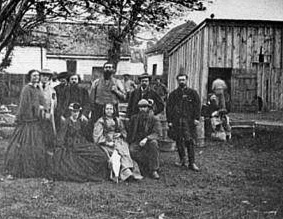 The women would have likely been handing out doughnuts prior to the troops leaving asthe Third Maine was an infantry unit with a long, long walk ahead of them. 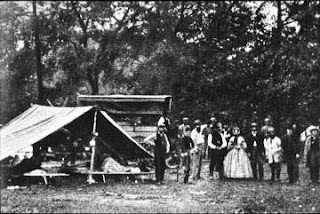 The solidiers were involved in some of the horrific campaigns/battles of the Civil War, including Gettyburg and The Battle of the Wilderness. Enjoy your work a great deal.